Earlier today, in response to a public question I asked at a full meeting of the Cambridgeshire Police Authority, it was revealed that Cambridgeshire Police are no longer planning to issue TASER weapons to non-firearms officers. I have been campaigning and lobbying against the previous government’s proposals to arm all frontline police officers with TASER weapons for a number of years. According to a report to the authority’s Professional Standards Committee on the 12th May 2010 roll out of TASER weapons to non-firearms trained officers in the force was to commence in September 2010, and the deployment was to be was to be accompanied by the production of a “Extended Operational Deployment of Taser Policy” and engagement with the media. Has this deployment occurred? Has the new policy been published? I am disappointed that the authority did not take the final decision on this extended deployment of TASER, classing it as an operational matter and leaving it to the police. I view it as a major strategic change with the potential to seriously damage the relationship between the police and public. The extended deployment of Taser has not occured and there are currently no plans to extend the deployment of Tasers beyond the Tactical Firearms Unit taking into account the cost and current financial climate. I am happy that the weapons will be remaining in a cupboard (many had already been bought and distributed to forces by the Home Office). I feel safer knowing that those officers armed with these weapons will be only those with the experience and training required. I would have preferred the reasoning to not only have mentioned cost, but also the potential impact on policing by consent. Elsewhere in the country though there area still non firearms officers armed with TASER. I would like to see the new government formally and clearly reverse the position taken by the Labour Home Secretary in November 2008 when the intent to get all front-line officers carrying TASER was announced. 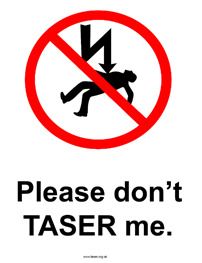 I fully support firearms police having access to TASER as an option. I think that every policeman who is armed with a gun ought to also have a TASER available so that the less lethal option can be used if it is appropriate for the situation. Opposing More UK Police being Armed with TASERs – Letter to my MP, David Howarth, September 2007. All UK Front Line Response Police to Carry TASERs – My article following the November 2008 announcement by the Home Secretary. Cambridgeshire Police Authority – December 2008 – First discussion of TASERs by Cambridgeshire Police Authority following the Home Secretary’s Announcement. TASERs for Non-Firearms Police – includes tables showing the number of TASERs for non-firearms officers distributed to forces. Me discussing the TASER rollout to non-firearms officers with James Whale on LBC radio. This entry was tagged Police, Police Authority, Taser on October 1, 2010 by Richard Taylor. I will be talking about this with Jeremy Sallis on BBC Radio Cambridgeshire at about 7am on Monday the 4th of October. I’ve been told the police and police authority are not putting anyone up. In my opinion, the lessons of the Raoul Moat debacle, including the engame involving tasers, is that any situation similar to that one would be over far sooner if all officers were firearms-trained and armed. Even if what you say is true, I don’t think we should change the way our streets feel all the time, and give up on policing by consent, just on the basis of rare incidents. A surprisingly large number of police officers are firearms trained and can be issued with weapons at short notice. My concern is that the level of force used routinely would rise, and there would be more cases of inappropriate levels of force being used by the police. This is what is seen in the USA where traffic officers often carry guns / TASERs they are often drawn and sometimes get used even during routine traffic stops. Interview done; it was at 07:11 this morning and will be on iPlayer later. I was interviewed, followed by someone from Amnesty both of us spoke welcoming the news Cambridgeshire is dropping its plans to issue TASER to non-firearms officers.